The idea of rendering into simple English important suktas of the Rg-veda was first given to me by Swami Smarananandaji Maharaj (at present the General Secretary of the Ramakrishna Mission). Even though I had been thinking about it for a long time I was not sure I could take up the work of rendering into simple English the important Vedic Suktas. Reasons were many. But his repeated suggestions spurred me into action and I started collecting the necessary material in the form of available printed books and photo-copies of rare books. The first attempt in this direction was an English rendering of Sri Rudram and Purusa Suktam, which has since been published by the Ramakrishna Math, Chennai 4. Even though 'Sri Rudram' is not sukta, it was chosen because it was popular and theme-wise was similar to Purusa Suktam. This was received well by the astikas. Next choice fell on Asya Vamiya Suktam as it was a difficult sukta, and therefore more challenging. Also because an English rendering based on Sayana's commentary was not available. It is a mine of philosophical ideas. I found that Sayana is the most dependable and helpful guide in understanding the suktas. Swami Smarananandaji was kind enough to spare his valuable time to edit this second book in the series. Many people have helped me in completing the above two books. But I can never forget the help rendered by the authorities of Sri Ramakrishna Ashrama, Indore, who provided me a comfortable accommodation at Omkareswar, enabling me to complete the works in a short time in the holy atmosphere of the place. Srimat Swami Ramananda Saraswatiji Maharaj, Head of Markandeya Sannyasa Ashrama, Omkareswar, readily spared his time to clear my doubts. It was very kind of him. Dr Goda Venkateswara Sastrigal of Chennai, an eminent scholar of Vedanta, has taken the trouble of going through the manuscripts thoroughly. Dr S Ramaratnam, Head of the Department of Sanskrit (at present Principal Ramakrishna Mission Vivekananda College, Mylapore, Chennai), has helped in correcting the proofs and offering some suggestions regarding Asya Vamiya Suktam. My grateful thanks to both. I have freely made use of The complete Works of Swami Vivekananda and Methods of Knowledge by Swami Satprakasananda, both published by Advaita Ashrama, Calcutta, in the introduction to this book in clinching certain arguments. I have been greatly helped by lucid exposition of Sayana's commentary found in Rg Veda Samhita, published in 1951, in Kannada by Sri Jayachamarajendra Vedaratna Mala, Mysore. The quotations from the various Brahmanas and Samhitas used here in the discussion and the references to the sources, are mostly taken from this book. It would otherwise have been difficult to collect them from standard texts. 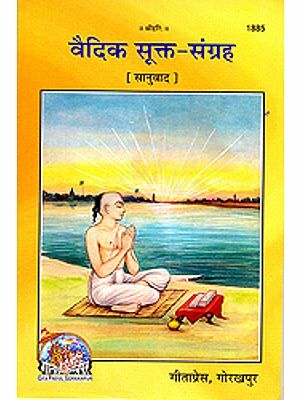 Coming to the present work Rg Vedic Suktas - Gayatri and other Suktas ( the third in the series) the importance of Gayatri and the secret of its appeal are taken up for a contemplative study. Two other related suktas have also been taken up for a study. As mentioned above, for this book, too I am indebted to the Kannada publication Rg Veda Samhita, old copies of which were made available to me by our Bangalore Ashrama. I am grateful to Swami Harshanandaji, the President of Bangalore Ashrama, for this kind gesture. I have made use of the Complete Works of Swami Vivekananda and the Life of Swami Vivekananda, both published by the Advaita Ashrama, Mayavati. Swami Kirtidanandaji, former editor of the Prabuddha Bharata, has taken pains to edit the manuscript. Sri Papi Reddy of the Ramakrishna Vanaprasthasrama, Hyderabad, provided a comfortable stay at the ashrama and also provided reference books. Sri P. Haridas, a senior advocate of Chennai, agreed to provide financial assistance to this book also, as he did for the second book. I express my gratitude to all these people. I sincerely hope that this small efforts gets the appreciation of the discerning public.